The Abu Garcia Kystsilda is supplied in a pack of 3, with four different weight options to choose from and is a durable set of sea lures, for amazing value for money. 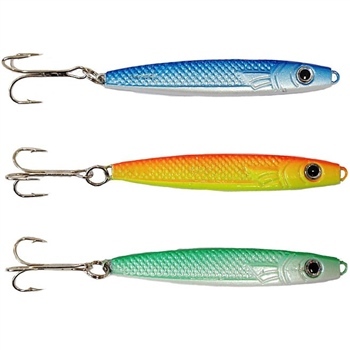 These lures are coated and include 3 vibrant coloured lures in each pack. The design of each lure is very life like, with patterned details on the body and 3D eyes that fish will find hard to resist! Each lure is designed from high quality materials and each one is fitted with a heavy duty treble hook that is needle sharp! The Abu Garcia Kystsilda lures include a blue, green and orange/yellow lure in each pack and is available in different weights that you can select from our drop down menu.